With gravatars now becoming ubiquitous in blogs and forums, I have developed an ASP.NET Control that encapsulates their functionality in a simple, reusable component. It’s so easy to use, you can download and be using it on your ASP.NET sites within minutes. I’ve since had a lot of interest in the source code for the control, and so this post describes how the control works, as well as providing a download containing the control, as well as the full control source and example website that uses the control. I introduced the control in February of 2008, and updated the functionality in March of 2008. OK, let me download it already! Download the Control and get started. Note that the demo projects included in the ZIP were written in Visual Studio 2005, so if you’re using Visual Studio 2008, you’ll need to convert the solution. If you’ve not done a conversion before, just follow the instructions that Visual Studio provides. Please also note that the solution will not open in Express Editions, since they do not support control projects. However, you can still use the control that’s included in the ZIP file. The root contains a small readme file, Visual Studio solution, FreshClickmedia.dll – the gravatar control assembly, Freshclickmedia.Web control project and GravatarSite website, which contains a few control examples. The default produces a hyperlink off to the Gravatar site with a title “Get your avatar”. The image contains the MD5 email hash, a rating of “G” (suitable for all audience types), and a size of 80. The control supports a number of properties supporting the customisation of its output. The size property of the control can be in the range 1 to 80. If it is outside this range, a default of 80 will be used. 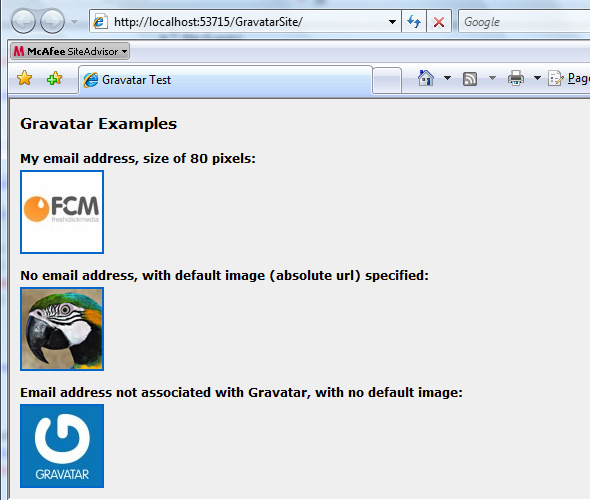 True by default, determines whether a hyperlink linking to the gravatar website will be output around the image. URL encoded URL, protocol included, of a GIF, JPEG, or PNG image that should be returned if either the requested email address has no associated gravatar, or that gravatar has a rating higher than is allowed by the “MaxAllowedRating” property. The code snippet below shows the associated properties. 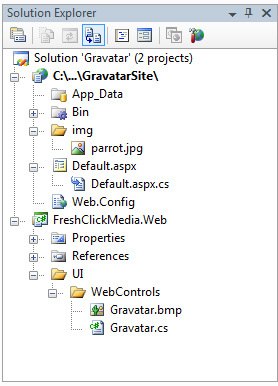 The Gravatar control derives from System.Web.UI.WebControls.WebControl and overrides the Render method. The various properties such as Email are all implemented as simple C# properties, with various attributes depending on the property. These properties are then used in the Render method to write out HTML using the method’s HtmlTextWriter parameter. The final part of the method assigns a default image, if one has been specified, outputs the site ink, if required, outputs the required attributes and tags. As previously mentioned, the download solution will not open properly in Express versions of Visual Studio, since it does not support control projects, but the control, included in the download is supported by all versions of Visual Studio, 2005 and later. The easiest way to use the control is to add the control to the toolbox. To do this, ensure that you are in design mode (looking at a web page), and right click on the ‘Standard’ group header of the Toolbox. 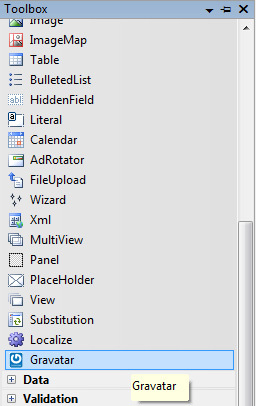 From the context menu, select “Choose Items” and browse to the assembly (Freshclickmedia.Web.dll), and click “OK” to add. From there, you can drag the control onto your page and start having fun! I was extremely excited about the Worldwide Developer Conference 2008, and so headed off to macrumors.com for a live feed of Steve Jobs’ keynote. After a rather slow build-up, the almost inevitable announcement from Jobs that the 3G iteration of the iPhone was made. And so, there must follow an end to the enormous amount of speculation in blogs and forums about the features of the second generation iPhone. I was extremely excited about the Worldwide Developer Conference (WWDC) 2008, and so headed off to macrumors.com for a live feed of Steve Jobs’ keynote. GPS. Once again, this is now becoming standard on high-end mobiles such as Nokia’s N95, so there was almost an expectation that this would feature. App Store. I welcome the addition of an app store – extending the functionality of the device is most useful, and it’s an additional revenue stream for apple. ‘iPhone in Enterprise’. Push e-mail and integration with Microsoft Exchange ActiveSync is a big plus for business users. Should Blackberry be worried? Now available in white. No doubt there will be a pink version soon. I’ll stick with black, thanks. The App Store interests me – particularly the iPhone version of Super Monkey Ball. The built-in accelerometer suits the game very well, and I look forward to playing some games on a mobile platform. What struck me more than anything, and something that was lacking from much speculation was the price. Although it’s somewhat irksome, considering I paid over £200 for my phone, I was shocked at the price of the new iPhone. $199 for the 8Gb version, and $299 for the 16Gb version is quite amazing, but let’s wait a little to see what carriers charge for a contract, and how long the minimum contract term will be. Shortly after the announcement, Apple’s UK site was updated with the 3G iPhone details, and UK iPhone carrier O2‘s followed with a ‘come back tomorrow’ teaser. Well, I reckon that the 8Gb price will be £129 in the UK with an 18 month or perhaps even a 24 month contract. How much an upgrade will cost is anybody’s guess, but hopefully, as the O2 website states, all will be revealed tomorrow. So, much of the speculation was correct, and although the price point is certainly attactive, I’m surprised about the camera remaining at its current specs of 2 megapixel. Whilst I think that this is ok, it doesn’t deal with any kind of movement at all well, and the delay is not acceptable. Perhaps a flash would have been too large a drain on battery life; increasing the megapixels, but not including a flash would have been an even stranger position than doing nothing at all. Perhaps we’ll see that in the third generation, along with the pink colour scheme.